Welcome to the Ash Class blog! 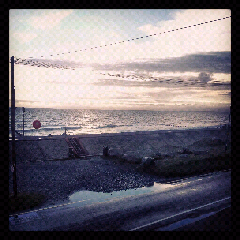 : Borth day one! Well the first thing was the journey - it was wet! All the way it was raining! It wasn't much better when we got there, but then we saw the dormitories which were great! Unfortunately we had to make our own beds, it was tough for some... Then we went to the seaside - everybody got sandy and wet! 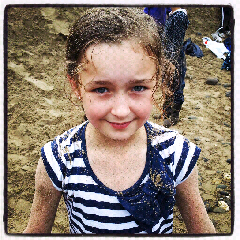 We had a few competitions at there sand dunes (rolling down, climbing up and scrambling up on out hands and knees!) But son we were back for lunch. 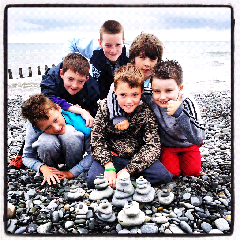 Afterwards we played on the beach - games, sports and a few sandcastles. In the evening there was a three course meal (soup, tuba pasta, macaroni it baked potato, and finally apple pie and custard - yum, yum!) and some time to rest in the dorms. Then we ended our devils day with a movie night - Gulliver's Travels - a brilliant day! 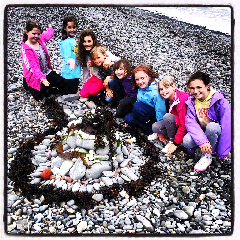 Great beach art girls, looks like your having fun despite the weather. Wow! Looks like you are having great fun - hope the weather improves! Remember to look after Mr.Morris, he is getting old! !